Hello And Happy Monday Crafty Friends! Tina here from Cards & Coffee Time. 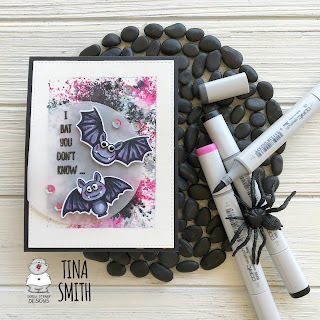 I have a fun project to share with you using the Bats! Stamp set along with the Coordinating Dies. I am just bats about the smile faces on these cute critters!!! You ever see a stamp set and every time you look at it...it makes you smile? 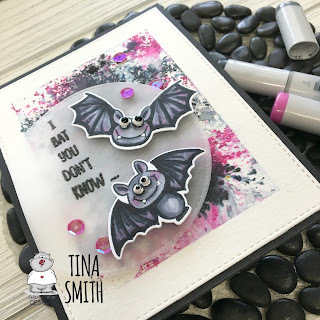 That is what this set does every time:) I created a background with shimmer powders and finished the sentiment on the inside the card along with a few of the bat silhouette images. I stamped on black card stock but no worries, a white gel pen works perfect for your message. You can watch how I created this card below. I hope you had a fantastic weekend and your week is off to a crafty start! Thanks for stopping by!